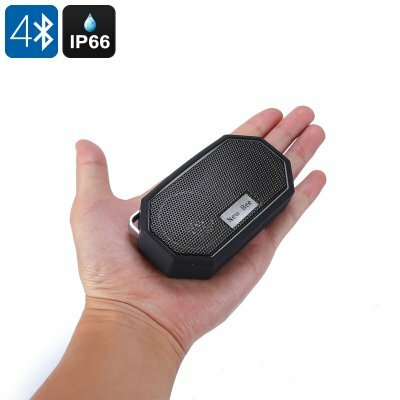 Successfully Added Mini Bluetooth Speaker - 3W Audio Driver, Bluetooth 4.0, IP66 Waterproof, 10m Range, 500mAh, 3.5mm Audio Jack to your Shopping Cart. Listen to music anywhere you go with this mini Bluetooth speaker. Thanks to its compact design, this wireless speaker can be carried around effortlessly anywhere you go. It even comes with a little hook that lets you conveniently attach it to your bag. This allows you to listen to your favorite tracks while you’re out for a hike or cycling your bike. With its protective rubber cover and durable design, this Bluetooth speaker has been made to withstand a hit. It features IP66 waterproof protection. This makes it not only resistant against water but also against dust. Therefore, you won’t have to worry about breaking your beautiful wireless speaker while taking it along to the beach. With its 3W audio driver at 2.402 to 2.480GHz, this Bluetooth speaker produces stunning HD sound. It treats you to an audiophile audio experience no matter where you’re at. Thanks to this, you and your friends will be able to enjoy your tracks to their most. With Bluetooth 4.0 connectivity, it features great transfer speeds. It is guaranteed that you’ll never experience any lag or delay while using this wireless gadget. A 500mAh battery is in place to deliver up to 4 hours of continuous usage time. This wireless speaker lets you enjoy your favorite tracks throughout the day without needing to worry about running low on juice. Besides playing songs out loud, it also allows you to enjoy your music in peace thanks to its 3.5mm audio jack. This mini Bluetooth speaker comes with a 12 months warranty, brought to you by the leader in electronic devices as well as wholesale wireless speakers..